» Can the Nats Keep Up This Pace? Playing in front of a sellout Dodger Stadium crowd, Bryce Harper, just the sixth player to make his major league debut as a teenager in the past nine years, made a big first impression. Which is great, because right now the 2012 Nationals are no different from the 2012 Phillies. OK, that’s not quite fair. The Phillies have a reliable closer. The Nats lead the majors in run prevention, anchored by one of the best starting rotations in the game. Through Saturday’s game Washington boasted four starters with ERAs of 1.64 or lower, and four with FIPs of 2.58 or lower. They finish April with a 1.78 rotation ERA, the first sub-2.00 ERA since the ’85 Cubs and the best mark since the ’78 A’s (hat tip STATS LLC, via @Ken_Rosenthal). The team’s blockbuster trade for Gio Gonzalez and its impossibly cheap one-year signing of Gio Gonzalez Edwin Jackson gave the Nationals the kind of quality depth that would allow them to compete with the best teams in the NL East and the best starting staffs in baseball. National publications have showered management with praise for building a much-improved team that only figures to get better with time. Deservedly so. The Nationals’ offense as currently constituted is, as fans of their Quebecois predecessors would say, merde. GM Mike Rizzo said he’d have preferred to wait on Harper. 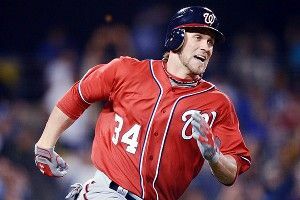 “This wasn’t the coming-out party for Bryce we had in mind,” he told the Washington Post‘s Adam Kilgore. Appearing on MLB Network’s MLB Tonight show, Rizzo said, “I would have loved to have gotten him 300 to 350 at-bats in the minor leagues.” Harper hit just .250/.333/.375 at Triple-A, which, combined with his .256/.329/.395 line at Double-A last year and his being six months shy of his 20th birthday, led many observers to opine that he wasn’t ready. Still, with Mike Morse and Ryan Zimmerman on the DL and little star power behind them, and Harper spending the minimum 20 Triple-A days required to ensure he can’t become a free agent until after the 2018 season, Rizzo clearly felt it was a gamble worth taking. Besides, while you could argue that 201 at-bats above Single-A aren’t nearly enough seasoning for a top prospect, they also might not be enough to predict whether or not a player with Harper’s prodigious tools will sink or swim in his first exposure to the big leagues. 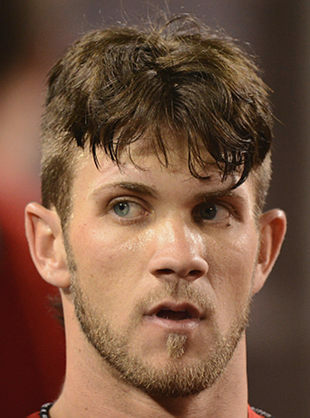 By now you probably know how Harper fared in Game 1. He bashed a screaming liner to the wall in center for his first major league hit, a play either marred or accentuated by a perfectly-in-frame mooning, depending on how you roll. He deftly went the other way on a low fastball in the ninth, breaking a 1-1 tie and delivering what might have been the game-winner if Henry Rodriguez didn’t subsequently remind us that he’s a Carlos Marmol starter kit in a box. He made another potential game-winning play two innings earlier, unleashing a spectacular throw from left field that would have preserved a 1-0 Nats lead if not for Ramos playing dropsies. He hustled like a fiend on even routine plays, knocked his helmet off his head to run faster (or something), and showed off the worst haircut in the history of Western civilization. All that just to get upstaged by the baddest dude in the business. Harper reached base twice the next day, only to watch his team get four-hit by Chris Capuano and company. After feasting on the likes of Chicago, Houston, and San Diego for the first three weeks of the season, it was telling to see the Nats face their first stiff test in L.A., only to score five runs in three games and get swept by the Dodgers. Until now, the party line on the Nationals has been, they’re tied for first while missing their two best position players, imagine how good they’ll look when everyone’s back and healthy. Maybe the real question should be, if Bryce Harper doesn’t put up big numbers, can the Nats keep winning 2-1 and 3-2 every night? How Can the Knicks Counter Miami's Fronting?